The venue's unique spiral staircase is another photo opportunity you won't want to miss, and of course, the ballrooms themselves are ideal wedding photography locations. Whether you and your guests are enjoying a great meal, or you are having a great time dancing, you are sure to love your photos from your ballroom wedding. At Style and Story, we are dedicated to providing brides and grooms with a wonderful wedding photography experience. Whether you want to get married at the Hilton Downtown Columbus or you have your heart set on another venue, we want to help you make your wedding photography dreams come true. Contact us to learn more about our services and to determine if we would be a good fit for each other. Included with every wedding package is complimentary hotel accommodations for the newlyweds. Your wedding guests can enjoy preferred hotel rates, giving them the opportunity to book a great room for less. With over 500 guest rooms, there is likely enough room for your entire wedding party to spend the night at the hotel, especially if your guests book early. Each of the rooms has either one king-sized bed or two queen-sized beds. They also include great amenities such as a flat-screen television, luxurious bathroom, stunning artwork, and great views. Guests spending the night can also take advantage of some of the hotel's great amenities including the fitness center and swimming pool. For your wedding guests who need a little extra room, the hotel has some connecting rooms. Some of your guests may also want to book one of the hotel's suites, which provide separate sleeping and living areas, and in some cases, an additional half bathroom. The Hilton Downtown Columbus is located in the heart of Columbus. It is about 8 miles from the John Glenn Columbus International Airport and 17 miles from the Rickenbacker International Airport. Your out-of-state guests can easily take a cab from the airport to the hotel, making this a convenient location no matter how far your guests have to travel. If you have guests who are coming a few days early or who are staying around for a few extra days after your wedding, they will love that your venue is right downtown, giving them plenty of options for things to do! There are over 300 dining and entertainment venues within walking distance. The hotel is also connected to the Greater Columbus Convention Center via the skybridge. Catering services are provided by the hotel. Included in the wedding package is a private cuisine tasting for up to four people. This is a great way to show your maid-of-honor and best man how much you appreciate their hard work and to get their opinion on the food. You can pick from an assortment of dishes, including chicken, seafood, vegetables, cheeses, and great soups. Each wedding package also includes a four-hour full bar. The George Bellows Grand Ballroom is perfect for large wedding parties. At 12,000 square feet, there is enough room for up to 500 people. The beautiful chandeliers give this option an elegant feeling. 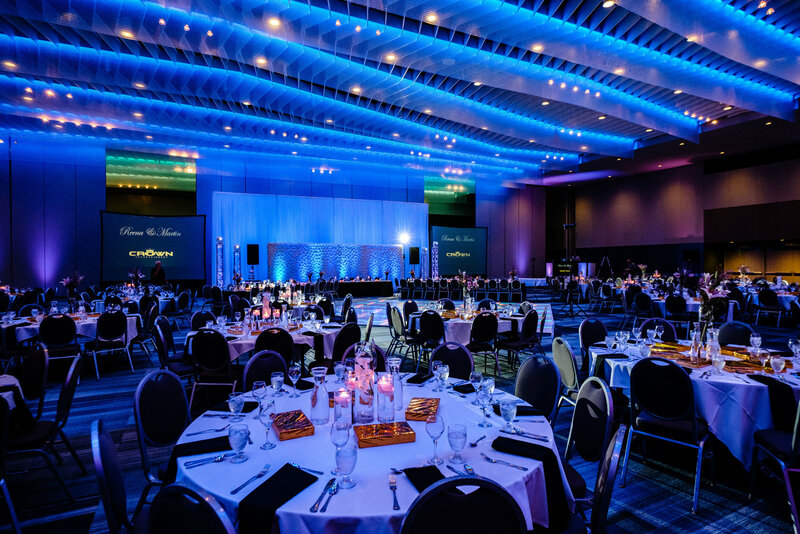 For those who want a smaller, more intimate celebration, the Hilton Downtown Columbus has two Junior Ballrooms, the Elijah Pierce Ballroom and Emerson Burkhart Ballroom. Both can accommodate up to 120 guests. With floor-to-ceiling windows, the natural lighting in either option is great. Plus, you and your guests get wonderful views of Columbus. 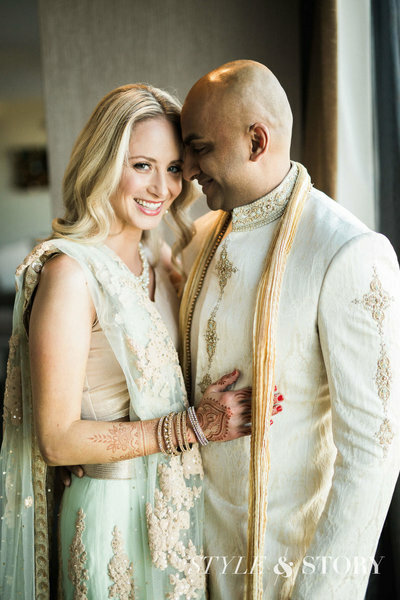 Click to see Sri & Caitlin's incredible wedding at The Hilton Downtown Columbus. 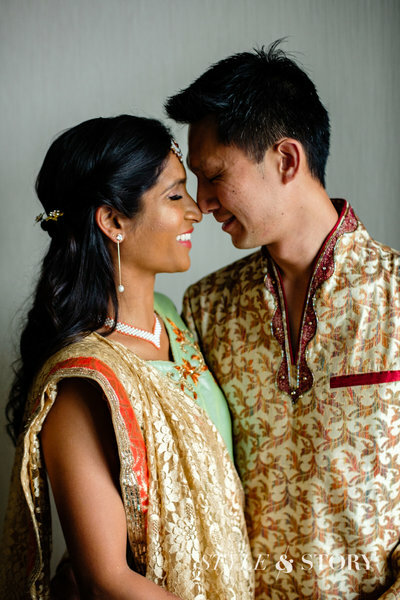 Click to see Reena & Martin's incredible wedding at The Hilton Downtown Columbus. 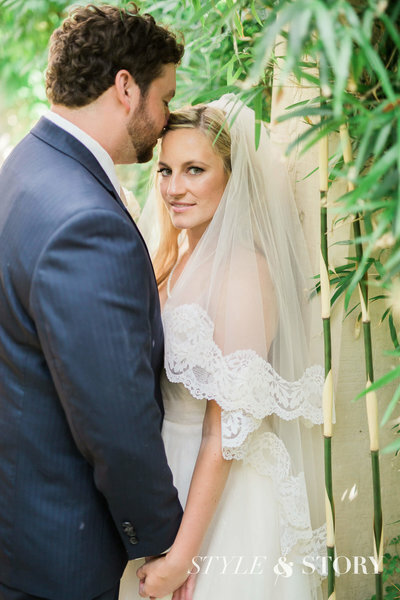 Click to see Lindsay & Johnny's incredible wedding at The Hilton Downtown Columbus.